Pacific Princess promises you an unforgettably luxurious vacation on the seas. With an award-winning spa and a specialty restaurant to its credit, the ship is sure to please with its pampering and gastronomy. Sumptuous buffets, decadent desserts, delicious grilled treats, and gourmet pizzas are the ship's culinary highlights. 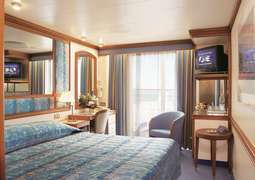 Also, Pacific Princess has a special selection of staterooms for guests with limited mobility. Daytime in the ship includes poolside lounging, swimming, and fitness activities, while nights are filled with glitzy dinner shows, theater productions, live events, casino fun, and more. Pacific Princess offers a great choice of itineraries, traveling to some of the most popular destinations across Asia, Africa, and South America, as well as to the exotic shores of many Southern Pacific Islands, Hawaii, and Alaska. 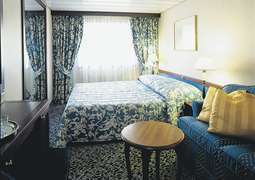 Princess Cruises' staterooms are impeccably furnished, and this ship's are no exception. 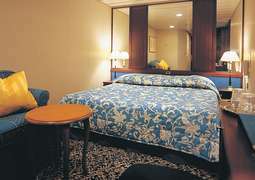 Every stateroom on Pacific Princess features a closet, TV, sofa, desk, and bathroom with a shower. 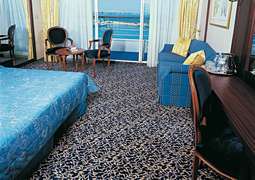 Ideal for small families on a budget, interior double rooms cover 158 square feet, while oceanview double rooms, with a porthole or balcony, are slightly more spacious at 146 to 206 square feet. For an extra luxurious stay, the 322-square-foot mini-suites or the 786-to-962-square-foot owner's suites are ideal. Get the most out of your cruise vacation by attending financial workshops, cooking demonstrations, maritime history lessons, and dance classes. Sports lovers will be delighted with the wide range of opportunities to get active, with volleyball, basketball, shuffleboard, ping pong, and golf facilities. Adventure sports enthusiasts can even sign up for PADI Open Water Diver certification. Young cruisers aged 3 to 17 years will love the ship's kid-friendly activities, which will keep them happy and occupied as you relax in the Lotus Spa, the ultimate wellness destination. While at port, Pacific Princess's dress code is casual. However, in the dining room, only smart casual or formal wear is allowed. For formal nights, ladies can wear cocktail dresses or evening gowns, while men can wear dark suits, tuxedos, or dinner jackets.